The way the cocaine traffic connection in Venezuela is rapidly being exposed, we can understand much better why is Chavez so desperately trying to start a conflict with Colombia or why he is chewing coca leaves in public. In fact, the very best hypothesis today as to why Uribe took the damning chance to have Chavez as an "intermediary" with the FARC was perhaps to have Chavez expose himself for what the bolivarian revolution has become: a morally corrupt entity. The dangerous gamble seems to have paid off. Chavez now is totally exposed as being at best too lenient with some within his army benefiting from drug trafficking from Colombia. At worst? The readers will decide themselves with the links below. The second article from the same Semana issue is about the lives and times of the recent drug lord killed in Merida, Venezuela. In this article you will learn how Wilber Varela "Jabón" moved to Venezuela under Chavez rule (2004) where he did battle rival gangs while the Venezuelan armed forces did play a role as an umpire for sale much more than any anti drug enforcement agency. These crimes, covered up by chavista officials, one day will have to be explained. 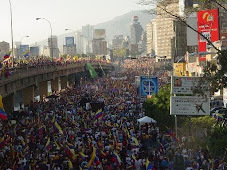 And where is the answer of Chavez to this mounting sea of corruption and drug trafficking? Last night in "cadena" he commemorated his getting into office, 9 long years ago. And what did he meditate on? As to whether the "oligarchies" of Colombia are worse than the ones of Venezuela. Some body should have the good sense to tell Chavez that covering up for drug traffickers is probably the worst crime that exists against a society, and that the drug oligarchy he is creating will soil his name for ever. Not to mention bringing one day a vicious reaction against all what Chavez stood for, even the good stuff of his early years.